A friend in the club asked me if I could help them establish a web presence by developing a simple website to share club information and post pictures of recent events. The primary criteria was a layout that the club secretary could update easily on a monthly basis. An existing logo and club brand helped guide the development. Site construction included incorporation of a contact form for club communication. Site construction also included logo design and contact form revision. 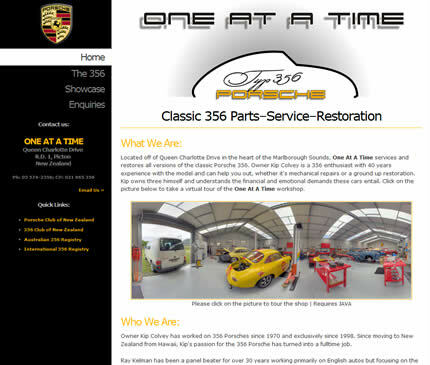 One At A Time is a local automotive restoration shop specializing in the classic Porsche 356. They have more than enough business through referrals withing the Porshce community, but still felt a need for a web presence as a point of contact and a convenient place to display their work. 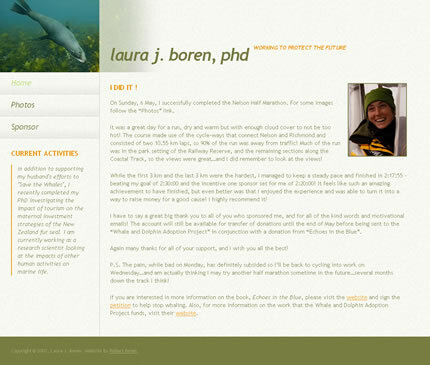 The solution was a basic brochure site with a design centered around their existing and very graphically strong logo. Site construction included incorporation of a shop virtual tour and a video walk around of a 356 Speedster. 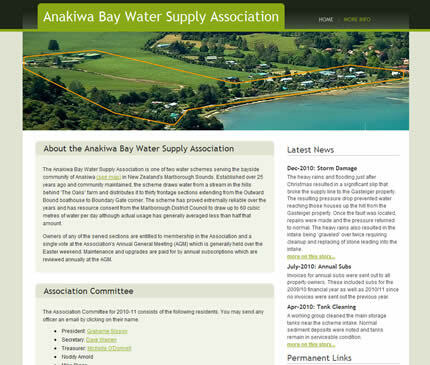 The Anakiwa Bay Water Supply Association is a community water scheme for 30 homes in the bayside community of Anakiwa in New Zealand's Marlborough Sounds. It was felt a website would provide the easiest means of diseminating information to members, not all of whom are permanent residents. A simple two page site was the answer to provide contact information and information updates. Site construction also included photography and incorporation of a Google map. 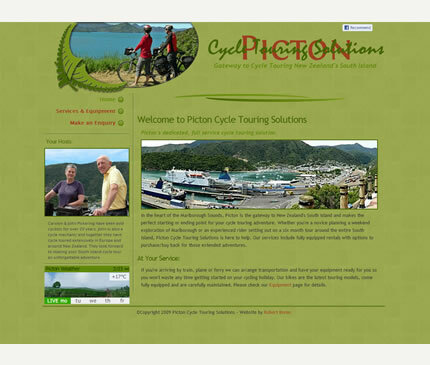 Picton Cycle Touring Solutions is a small, family owned and operated cycle touring business in Picton, New Zealand. 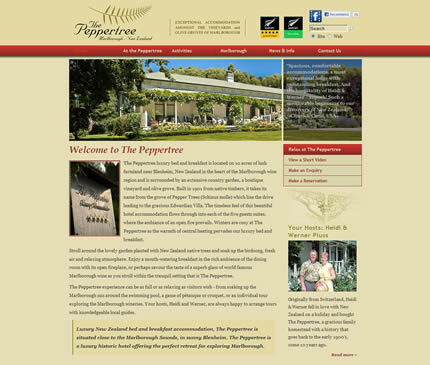 They needed a simple yet professional web site that conveyed the ‘green’, outdoor nature of their business. Discussions with the client resulted in a strong, contemporary design in shades of green that reinforce the natural image they were seeking. Site construction also included photography, incorporation of a weather widget and inclusion of a Google business and map listing. 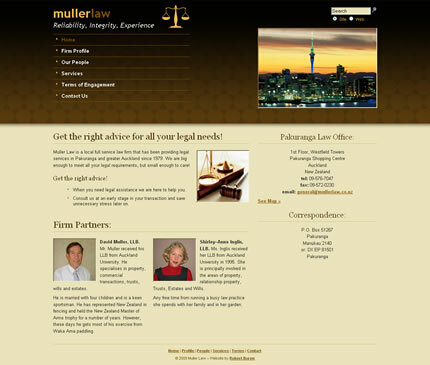 Muller Law is a small, family oriented law firm in Pakuranga, a suburb of Auckland, New Zealand. 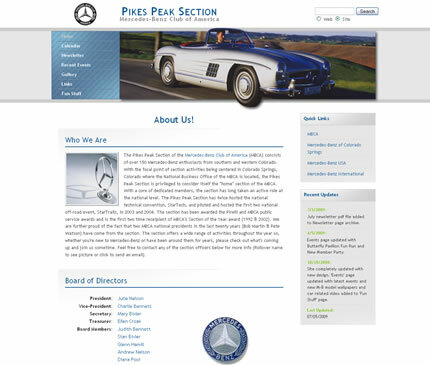 They required a simple professional web presence that was both inviting and informative. Close consultation with the client resulted in several design iterations that produced a clean, contemporary design in a warm, confidence inspiring, earthtone colour scheme. I also worked closely with the client to integrate the site with existing email service and to include a Google business and map listing. The clients had a website and were referred to me by award winning photographer, Frank Gasteiger, whom they hired to take new advertising photos. The challenge was to incorporate as much of Frank's superb photography as possible with the in-depth content in a fresh new look while still maintaining an established corporate identity. Navigation was simplified by the use of an AJAX tabbed interface on the content rich pages while modal windows are used to display video like slide shows of Frank's photographs. 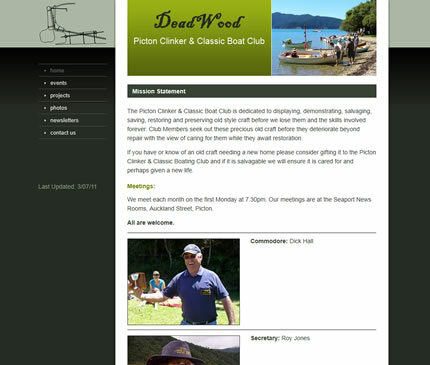 This is a website I maintain for a car club I've been a member of for years. In many ways it's also a test site as I use it to try new techniques and approaches for displaying the varied content. As a result, I've also redesigned the site about four times over the years as I become inspired by new trends in web design. Among other features, the site makes liberal use of modal windows to display images and galleries while an AJAX accordian minimizes screen space while providing speedy access to event galleries. I was originally asked to design the cover for the client's novel. 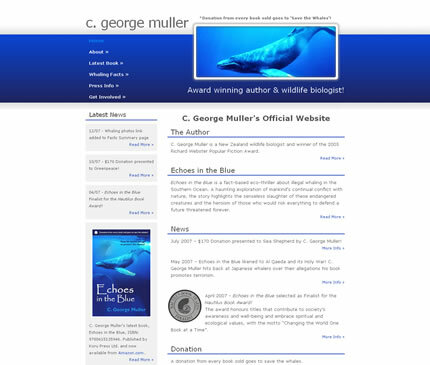 After publication, I was asked to develop a website consistant with the bookcover that would not only provide information on the book and author but the issue of Japanese commercial whaling in the Southern Ocean. This resulted in an information rich site requiring clear, consistant navigation. The site incorporates a vertical dropdown menu with extensive internal linking for ease of access. It also includes a multi-function contact form with spam protection. This is a personal site done for my daughter. While originally intended to promote sponsorship for some personal endeavours, the idea was to transition it to a professional “resume” site. The design thus reflects both her professional interests as well as her personal preferences and committment. While relatively simple, the site does use a modal window for gallery display and incoporates a fully “liquid” design that changes to fit different browser resolutions. 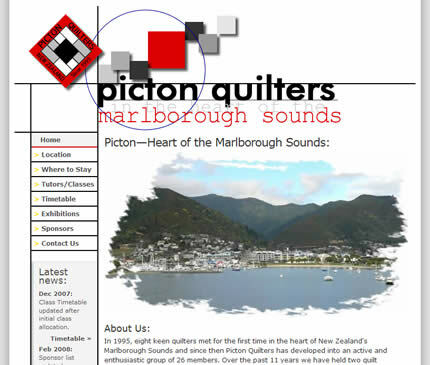 While no longer live, this site promoted a National Quilt Symposium. The design was based on a poster done earlier by a graphic artist who was a member. 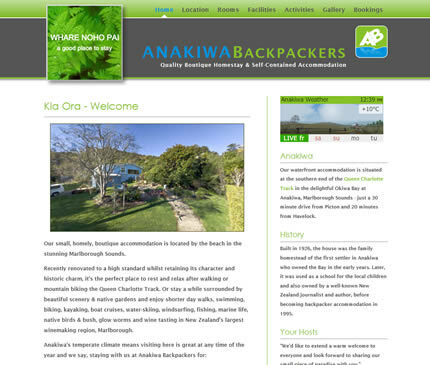 This was another information rich site, including class schedules & and descriptions, tutor bios, downloadable newsletters and linking to sponsor and partner websites, which required an easy to follow navigation structure. The site also incorporated an online registration form and proved instrumental in the ultimate success of the symposium.